In Britain we have so far failed to civilise the car, and we have failed effectively to separate cycling from the car. In doing neither, we have failed to produce a cycling culture. I was very disappointed by Mikael Colville-Anderson's comments in the April–May issue. I really think he ought to find out more bout cycle campaigning in the UK before he passes judgement on us. We seem to be in [sic] caught in a cleft stick – on the one hand we are characterised as vehicular cyclists who are confident on the road and have no conception of what it is like to be a novice cyclist, and on the other we are only interested in fighting our own corner. If the former were the case, why would we bother? Britain could learn volumes from the Danish and Dutch experiences. [Your] reluctance to advocate protected infrastructure is the broomstick in the spokes. In Britain, it seems to be small groups of [different] "cyclists" advocating for no one but themselves insted of promoting a return to a Britain where the bicycle was, if not king, then crown prince. This sub-cultural focus on cycling is the greatest hindrance to Britain's re-emergence as a cycling nation. Which is bang-on. The CTC's practice of claiming to represent "cycling", and by implication, all UK cyclists, to government, while actually only representing one minority tradition, or sub-culture as Colville-Andersen puts it, that of leisure cycle touring on the roads, has long been a big problem with cycling's representation and image in government. The CTC has made some effort to broaden, but not enough. Their re-branding of a few years ago, changing their name, from "Cyclists Touring Club" to "CTC", was a classic fudge, a missed opportunity to really change, get a proper new name, and become the proper national UK advocacy body for all cyclists. The basic problem is that they have never advocated for the conditions necessary for the large mass of the population who will never define themselves as "cyclists" to start to use the bike for the short utility journeys to which it is ideally suited. Similarly Cyclenation, which also claims to be a representative national body for cycling, an overarching body to which local campaigns subscribe. Cyclenation cannot seem to escape from the tyranny of the close-minded John Franklin Cyclecraft vehicular cycling philosophy, which effectively just excludes the vast majority of the population from the joys of the bike, while re-enforcing the grip of car culture in the UK. It is into this yawning gap in UK national-level cycle advocacy that the Cycling Embassy of Great Britain has been brought into being, by a group of extremely frustrated individuals. Note how Geller's letter on behalf of Cyclenation does not really deal with the issues. It criticises a foreigner's subjective impression of the UK cycling advocacy scene, but does not broach the, for Cyclenation, too-delicate substance of the original article, the assertion that a mass cycling culture in the UK comparable to what has been achieved in several European nations is simply not possible without substantially separating the car from the bicycle, through high-quality dedicated cycle engineering. CTC would of course agree with the proposition that large-scale investment in quality cycle facilities could substantially increase cycle! [sic] After more than 50 years of car-centric planning and highway design, much of our road network is thoroughly off-putting to the majority of would-be cyclists, especially children (and of course their parents). We would like to see every road in the UK transformed, so that cyclists of all ages and abilities can get from A to B easily, confidently and safely, wherever they are going. We are a very long way from achieving that vision. Actually, on most urban streets, the solutions don't require a great deal of funding – we just need to introduce 20mph speed limits. Even in the most cycle-friendly countries such as the Netherlands, most urban streets simply have a 30kmh limit, perhaps with some nicely-designed traffic calming, and no cycle-specific provision whatsoever. .... Elsewhere though, busy urban streets and one-way systems may require more radical overhauls, and major inter-urban dual carriageways and their associated junctions certainly do! However if the answer to those main roads is segregated facilities, we first need to work out how we persuade politicians and traffic planners to allocate the road-space and the funding needed for these to work well. It is really important to build on this political will, and not to scupper it though in-fighting. In the early 1990s the cycling lobby did a fantastic job of building the political will for the then-Government to launch a commendably ambitious (but woefully under-resourced) National Cycling Strategy in 1996. Then what happened? - we managed to fall out spectacularly over this very issue of segregation. The result? - Ministers concluded that cyclists themselves couldn’t agree what we wanted, and therefore gave us nothing. The NCS fell apart and the targets were quietly dropped a few years later. Please let's not make that mistake all over again. I am afraid this is a funny old interpretation of history. For the National Cycling Strategy of 1996 was deeply flawed from the start and was never going to go anywhere. For, influenced by CTC and CCN (now Cyclenation), it was a vehicular, and thus an exclusionist cycling strategy. Geffen is right in saying "Ministers concluded that cyclists themselves couldn’t agree what we wanted, and therefore gave us nothing", but much of that disagreement came about through disinformation put out by CCN, as I pointed out before. 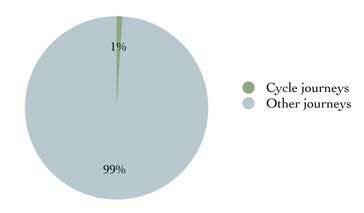 The good news is that cycling gets safer the more cyclists there are: cyclists really do gain from "safety in numbers". London is an excellent example of this: cycle use has more than doubled in the past 10 years (up 117% on London's main roads) while cyclist casualties are down by 24% - which means that the risk per cyclist is down by something around 50%. Leicester is one of a number of other towns and cities which have achieved [a] similar result. That isn't to say that London has reached cycling nirvana - far from it. The point however is that, if we portray cycling as far more dangerous than it really is, we are shooting ourselves in the foot in our efforts to encourage more people to cycle, and to discover all its benefits in terms of health, time-saving, money-saving, and the sheer fun one can have while simply getting from A to B. Is there any other way of getting around to match it? Meanwhile, promoting the positives of cycling can help improve cycling conditions, not just through the "safety in numbers" effect itself, but also potential[ly] by boosting the number of votes in cycling. The more people there are cycling, the more politicians will be prepared to support its continued growth. So please, for anyone looking to build increased political support for cycling, we do ourselves no favours by "dangerising" it. We have far more to gain by promoting its health and other benefits, rather than giving people safety-related excuses for deciding not to cycle. Not everyone... Not everyone!!?? I ask you. I think definitely 1% of the population is not everyone. The CTC conception of "not everyone". The "safety in numbers" hypothesis I have dealt with before on this blog. It is false. Cycling is currently increasing but getting more dangerous nationally. In London, on the TfL road network cycle safety has flatlined since 2004 despite a 70% increase in cycling there. The question is, who is really "shooting themselves in the foot", in Geffen's words, those who are realistic about the danger of cycling and about the fact that it is danger that is putting virtually everybody off, and who recognise that to reduce that danger and get more people cycling the only sensible option is to learn from what has worked elsewhere in Europe and the world, or the CTC and Cyclenation, who remain in denialist mode about the real reason that 99% of British people will not consider cycling, and unwilling to learn the international lessons? My arrival back in the UK on my 60th birthday began with the nightmare of cycling off the ferry and through Dover. I wonder what European visitors think? Cyclists are expected to dice with death – what grim welcome! I blogged yesterday about The News of the World scandal, and our politicians cosying up to News International. At the time I didn't think of any connection of News International to cycling, but of course there is one. The connection is Europe. The papers owned by Rupert Murdoch, an anti-EU Australian with a transatlanticist viewpoint, have consistently, over many years, fed the British people a diet of rubbish and misinformation about the European Union and European culture generally (where they have not ignored it totally). The result has been to breed, or encourage, in the British public a tendency to distrust European solutions to any problems, from law and order to the environment to defence to transport. We had an example of this in the recent referendum on electoral reform, where we were asked to choose between the traditional "winner takes all" system (normally, but inappropriately, referred to as First Past the Post) and the Alternative Vote system. But the opponents of change were able to argue that the Alternative Vote is used hardly anywhere in the world, which is true. It is an English-language world innovation; it comes from Australia. Nobody in the UK really wanted the Alternative Vote, which is very similar to the existing system, but with additional complications, which is why the campaign for change lost spectacularly. People in the UK are split between those who don't care, those who like the current system (which suits the Conservative Party most of all), and those who want Proportional Representation (or "Fair Votes"), as they have in the rest of Europe. But we were not offered the European solution. The same has been true in cycling. We have not been offered the European solution. David Hembrow has remarked on the unfortunate way our media, where it picks up on cycling stories from overseas, tends to concentrate on those from the low-cycling English-speaking world, while largely ignoring what goes on just across across the North Sea, where the world's highest levels of cycling are to be found. My wife and I have been discussing the perception of us as everyday transport cyclists with children. Most people including our parents think we are strange and it is an odd thing to do. It is almost impossible to discuss things with people because as soon as you mention that for Holland/Denmark/Germany we would be considered normal they just say, well its different there and ‘bang’ they have closed their minds. This closed minded attitude does not exist with American culture which is celebrated and copied ad nauseum. I think people in the UK are culturally conditioned not to want to follow Europe and so our problem of advocating Dutch style cycling is complicated by the general Euro-phobic nature of the UK. I think this is right. To what extent "the general Euro-phobic nature of the UK" has influenced the policies of our cycling organisations is difficult to say, but they have certainly been influenced by the relative freedom with which information comes to us from the English-speaking world, compared to the restricted access implied by the need for translation, as I mentioned in my earlier post on Cyclenation. And it is a problem that we have to convince politicians that this is an area where we need to follow Europe, when they are mostly mistrustful of European solutions. The letter from Simon Geller to Cycle magazine shows that Cyclenation do not really take in the issues yet. He has not appreciated the importance of what Colville-Andersen says, because like all people who are part of a problem, he can't see it – like the motorists stuck in jams who complain about the "bloody traffic". I will warm to Cyclenation and CTC the day they break free from the Franklin "training, not infrastructure, is the solution" motorised status quo supporting hegemony, and start advocating for the provision of effective cycle infrastructure for all cyclists. Your comments on the Euro-phobic nature of the UK are absolutely right, added to which the owner of most of the press in the UK are also extremely Euro-phobic. Sadly, it would appear that CTC and Cyclenation also look in the wrong direction for ideas, all of which is very sad. I agree with virtually every word you say, except where you say, more or less explicitly, that cycling is dangerous. It is not, relatively speaking and relatively is the only way you can speak of any type of risk. Cycling is no more dangerous than many other activities or pastimes, and indeed in some respects is less so, as popular rebuttals to the notion of compulsory cycle helmets show - pedestrians, pub-goers and even motorists would enhance their safety by a greater margin than cyclists if they were to wear helmets. Similarly, we eschew the notion of weird clothes (high-vis lycra etc) on the grounds that they, with helmets, give a false impression of how risky cycling really is. Much more to the point is, as David Hembrow repeatedly says, subjective safety. Just as people falsely assume that flying is dangerous (although it doesn't seem to stop them doing it) when in fact they are at far greater risk driving to the airport, people fear the danger in cycling, and their fear is not so irrational - a truck passing you at 30 or 40 with only a couple of feet to spare feels dangerous when of course "a miss is as good as a mile", and even if you are coldly rational about the true danger, it feels bloody unpleasant. As politicians of virtually all parties now accept that cycling and other active travel is an essential strategy for health, congestion, pollution, etc ergo it is a good thing and should be encouraged, they need to recognise what motivates, or discourages, non-cyclists from starting, and deal with those factors. That means, in some contexts, physical separation. Safety in numbers and other such concepts beloved ot CTC and CycleNation are not entirely irrelevant, but they are way back down the list in tems of provien or predicatble effectiveness. "I agree with virtually every word you say, except where you say, more or less explicitly, that cycling is dangerous." But cycling is relatively dangerous compared to other modes of transport, eg car, bus, train,... (The only exception I can think of is making a journey by motorcycle, and maybe also on foot). It isn't dangerous enough to warrant not cycling, but then we we get into the area of subjective safety. Properly executed, improved conditions for cycling will cause improved subjective and actual safety relative to other transport modes. Insightful stuff about Europe - I hadn't thought about it. So what do we do? Stop harping on about Dutch-style cycle lanes (when campaigning, not technically)? Seems to be what LCC have done in their current referendum - and as you point out, the language they choose instead will be too easy for Mayoral candidates to agree to and then wriggle out of. How can we describe what we want without immediately making people switch off, but at the same time being sufficiently specific? I'm glad to see this issue being put under such a bright spotlight. I wasted 20 years as a "vehicular cyclist". I still race bikes on the weekend, but use a heavy bike on bike paths for my commuting. We get one life. No point risking it in a protest, where the most we can win is the right to share the road with heavy machinery. Glad to see that a response to a fairly short letter by myself can be conflated into a 2724 word blog post. None of the things you mention in your post have anything to do with what you claim I was complaining about, which was Mikael's claim that cycle campaigners in the UK are complacent and self-serving. (I don't have the original article to hand so I can't quote verbatim.) This I felt did a lot of hard-working people in the UK an injustice. Cyclenation does support segregated infrastructure where it is appropriate and indeed we have good relations with the Cycling Embassy but we have been very disappointed with how it has been implemented in the UK, whether through Local Authority schemes or via Sustrans, and we have spotted that it is not the only thing that countries like Holland, Germany and Denmark have going for them in terms of cycling - slower road speeds in urban areas, strict liability and cyclists right of way at junctions being the other key factors. To cover a couple of other points, John Franklin is our webmaster but has no other influence over the Cyclenation Board, having stepped down as Chair several years ago. (The board is made up of representatives from campaign groups across the country) Also would like to mention that I made the point in my original letter that the author of the piece could have asked us as the foremost cycle campaigning group in the UK what we thought of the current state of campaigning - the editor chose to delete that point.